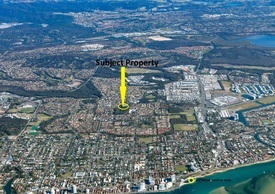 PROPERTY OVERVIEW >> $198pw -- Price incl. Premier serviced office in the most prestigious commercial building in Surfers Paradise. Enjoy panoramic ocean and hinterland views from this brand new workspace along with a light, fresh and modern style to keep you motivated and inspired. This global office provider specialises in flexible workspaces and great meeting room facilities at affordable prices, devised to make it easier for entrepreneurs, SMEs, project teams and corporate firms to achieve success. With a coworking desk or private office space you’ll also benefit from access to training and meeting rooms, high speed internet, reception and admin support, printing stations, casual breakout areas, kitchen facilities and an onsite coffee bar. Outstanding value for money from one of the world’s longest-standing workspace brands and in one of Surfers Paradise’s top serviced offices. Tours available daily and enquiries welcome. This leading serviced office is in the iconic 50 Cavill Avenue building, a distinctive A Grade commercial tower incorporating cutting-edge technology and brand new facilities. With four sides of natural light, three prominent street entrances and a location in the heart of Surfers Paradise’s commercial precinct just steps from the world famous Main and Broadwater Beaches, it has attracted notable tenants such as Nine Network Australia, Mantra Group, PWC and CBRE. The 22 floor commercial tower offers 446 secure basement car parking spaces, six high speed destination control lifts, energy efficient air conditioning, a 3-Star Nabers Rating and state-of-the-art end of trip facilities. Surrounded by cafes, restaurants, retail, business services and beaches, this attractive building makes doing business on the Gold Coast an absolute pleasure.